The other third-rate dark roast coffees are bitter, acidic and are for limp-wristed socialists. Thank God for the MAGA Dark Roast COVFEFE! 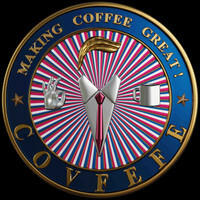 The bold taste and smoothness of the MAGA Dark Roast COVFEFE is specially crafted for those who seize the day and put America First. The other loser dark roast coffees can't compare on taste or values. Sad! Making America Great Again starts at home and with a cup of MAGA Dark Roast COVFEFE!